I had intended to make progress on a new novel yesterday, but a couple of events got in the way. One was a #ConfrontCorruption vigil in Times Square in response to our leader’s obsequious performance at the summit with Russian autocrat Vladimir Putin in Helsinki earlier this week. The other was a limited-run screening at the Museum of the Moving Image in Queens of the Serbian documentary The Other Side of Everything, directed by Mila Turajlić. Like another resistance film I profiled, Burning Bush, this one is distributed through HBO Europe, but it’s available for screenings in the US through Icarus Films. 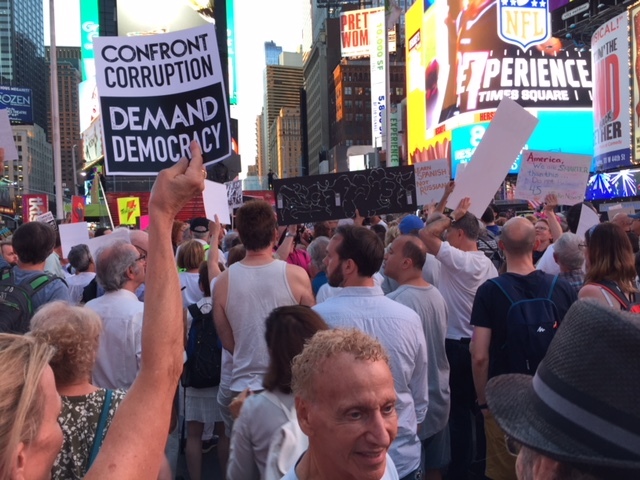 The #ConfrontCorruption rally in Times Square, just before sundown. The documentary begins with 69-year-old Srbijanka polishing handles for a door that will soon be opened to join her apartment to the adjacent one. After the Communist takeover of Yugoslavia, around the time of her birth, Party officials demanded that the well-to-do family turn over half of their space to people who had little or none. Their bathroom became a common bathroom in the hall, and the new next door neighbors — government loyalists — spied on them. Later we see the neighboring family’s surviving member, a bedridden 90-year woman, answer a census stating her loyalty to Milosević’s nationalist successors. 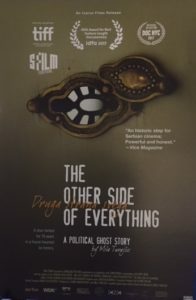 Through images, we see “the other side of everything” is a significant number — often a majority — that worships power and strength, “blood and soil,” and has little respect for diversity, democracy, or individual rights. Mira Turajlić deftly weaves archival footage with her mother’s reminiscences. One of the most powerful scenes for me was that of Serbians standing along highways waving to soldiers in tanks heading to battle in Slovenia, Croatia, Bosnia and Herzegovina, where many committed atrocities and others came back in body bags. Western sanctions made food scarce and money worthless, but, almost inexplicably, people continued to vote for Milosević. We see footage of the 1999 bombing of Belgrade, and demonstrations in which Milosević called out ten thousand of his supporters to face off against ten thousand anti-government demonstrators with police in the middle to prevent all-out civil war. And finally, the October 5 revolution, demonstrators storming the presidential palace and parliament building, setting fires and seizing furniture in their pent-up fury. Into this power vacuum following Milosević’s resignation and flight, Srbijanka and the other OTPOR leaders stepped in to restore order and institute a democratic government. She points out that revolution is the easy part, and “what happened on October 6” the greater challenge. She became the Minister of Education, and worked with the other political “amateurs” to change not only a government but a culture. For the most part, she says in the documentary, they failed. Through specific images — a painting hidden behind a wall from the Communist era on, the locked and glued-shut door to the neighbor’s apartment, census questions on “nationality” and “religion” that Srbijanka refuses to answer but the neighbor answers enthusiastically — the filmmaker shows how a refusal to address history honestly, suspicion of the Other, self-aggrandizing nationalism — contribute to the failure of the democratic revolution. But even though Srbijanka considers herself retired, she feels the pull to engage (and after the film was made became a co-founder of the Movement of Free Citizens to oppose the right-wing, pro-Putin “populist” government), and argues with her two daughters who consider emigration. I consider the sacrifice of a day of writing worth it. Seeing The Other Side of Everything moved me to attend the evening rally — because, like Srbijanka Turajlić, I wanted to do something in my small way to change things in my own country rather than complaining within the four walls of my apartment or emigrating to a place with more freedom and opportunity. Obviously, her efforts were more prominent than mine, one more body at a demonstration and one more blog post, but one never knows what efforts ultimately have impact. And if she continues to work for peace, justice, and intercultural understanding despite many setbacks and few victories, so can all of us. What a powerful and sobering film. Thank you for telling us about it, Lyn. 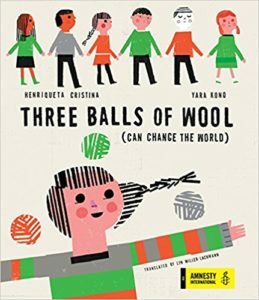 Since it’s a HBO Europe production, you should have wider access to this film. I hope you have a chance to see it soon.